Alvaro Morata celebrates after scoring his team's fourth goal with his team mates during the UEFA Europa League Group L match between Chelsea and PAOK at Stamford Bridge on November 29, 2018 in London. Before kick-off Chelsea believed a point was required to confirm top spot and qualification from group L in the Europa league, but Bate Borisov’s victory against Vidi ensured that Chelsea had progressed to the knock out stages before our fixture against PAOK had begun. As quick as it had begun, it was all but over for our Greek visitors. Within seven minutes of play, a loose back pass put Giroud clean through, and the last-ditch tackle from Khacheridi brought the forward down just outside the penalty area. He was the last man, and the red card duly followed. Fabregas dragged the free-kick wide at the near post, but Chelsea had already looked well on top in the preceding six minutes of play. Surely a break through was a matter of time. After going down to ten men PAOK changed to a 4-4-1 system. against Chelsea’s three-man midfield there was inevitably spaces in the centre of the pitch. PAOK moved their back line higher to close the space between defence and midfield, this meant balls over the top were now a viable option. It was the space afforded in front of their midfield that proved their undoing as Fabregas took control of the match. With the PAOK midfield scared to press too high up the field for fear of exposing themselves behind, Fabregas was afforded plenty of time and space in which to pick his passes. He did this superbly and proved to be the key player for the blues. 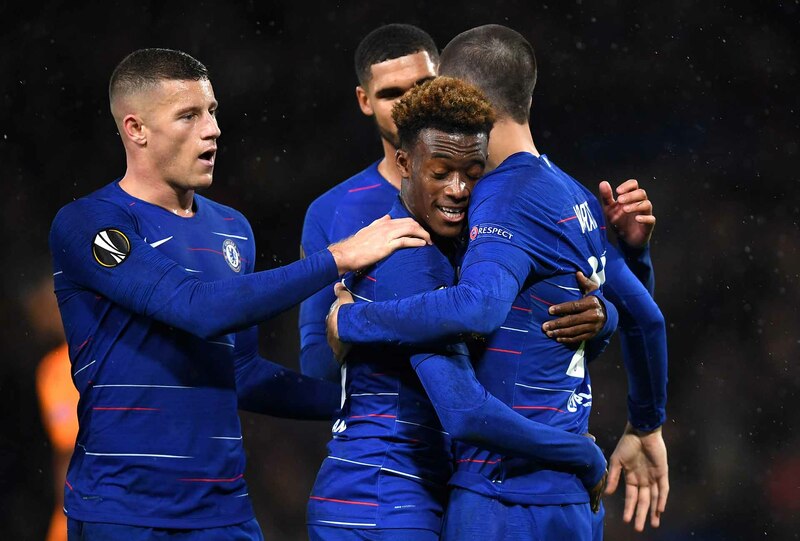 Hudson-Odoi also shone. He peppered the PAOK box in the early stages. Giroud had a floated cross from the left by the Londoner taken off his head by centre back Crespo, another flashed passed him. It was the same scenario from the right curtesy of the over-lapping forays forward by right back Davide Zappacosta. Again, Giroud only just failed to make contact with a ball fizzed in from the Italian. The breakthrough was delivered via a text book Fabregas pass from deep. Having time to deliver he picked out Pedro on the edge of the area. His touch was excellent as it continued to be throughout the course of the match. He turned on the ball and played it to the right side of the penalty area where Giroud swept the ball into the far bottom corner in front of the shed with a first time left footed effort. This didn’t silence the away following though, who continued to sing for their side throughout proceedings, including during the half time break. Surely one of the best displays of support seen by a visiting set of fans at Stamford Bridge. Chelsea now enjoyed almost unbroken possession. Hudson-Odoi picked out Giroud with a well weighted clip through, but on the turn the forward fired over from ten yards down the left of the box as the ball came over his shoulder. Giroud doubled his tally for the night with a chance equally as hard to execute in the thirty seventh minute. Fabregas played the ball of the night from deep in midfield to put the ball inch perfectly for Giroud, and the French forward didn’t disappoint, a first-time left foot volley beating the keeper for pace at he near post. This was the nail in the coffin for the visitors who hadn’t yet mustered a chance in the match. Hudson-Odoi rattled the bar from the edge of the area soon after with a bending left foot strike. Chelsea went in at the break 2-0 up, but it could have been more. Chelsea again dominated the ball in the second half, but with PAOK now in damage limitation mode initiated by moving the back line deeper, it was more sideways balls across the pitch, and inevitably less chances created than in the first half. Loftus-Cheek was looking good in the Chelsea midfield, and nearly scored after a powerful run brought him into the area, but the keeper made a good save diving to his right to tip round the post. This was the second good save Paschalakis had made from Ruben. In the first half he got a fingertip to a rocket of a shot from range. Fifteen minutes after the start of the second half Hudon-Odoi got a well-deserved goal. His first for Chelsea. It was again Cesc Fabregas who played a key role, getting his second assist of the night. The ball was worked across the box from right to left, Hudson-Odoi made an angle between two defenders and angled his shot in at the near post. He rightly enjoyed a goal his performance had deserved. Chelsea probed further. Pedro got in down the inside right channel, but his shot was just passed the far post. Alvaro Morata replaced Olivier Giroud with fifteen minutes remaining and promptly scored with a great header three minutes later. It was a fantastic cross from Hudson-Odoi from the right this time, as he added an assist to his goal. Chelsea have dominated the group from start to finish and with one matchday remaining in the group stage, are 9 points clear, and on more than double the points of any other team. By topping the group, we are rewarded by facing a team that comes second in one of the other groups. Arirzabalaga; Zappacosta, (Ampadu 63), Christensen, Cahill ©, Emerson; Barkley, Fabregas, Loftus-Cheek; Pedro, (Willian 66), Giroud, (Morata 75), Hudson-Odoi.